Kum-Pet Dog and Cat Feeder. Brooklyn, New York. Lorraine Metal Specialties Company, a division of Lorraine Lighting Products Co, late 1940s. 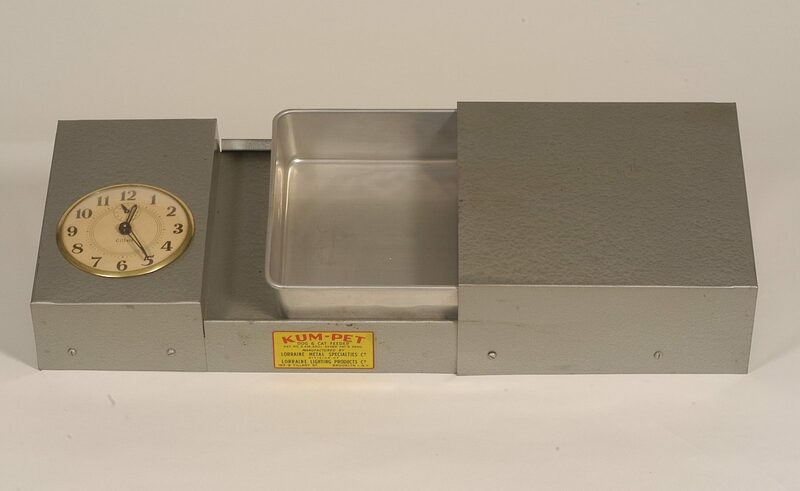 The Kum-Pet Dog and Cat Feeder is one of several automatic pet feeders in my collection. Its mechanism is simple. A wind-up alarm clock, mounted flush into a galvanized metal frame, is set with the time for the pet’s meal. When mealtime is reached, the tension unwinding spring that operates the clock’s alarm also spins a metal spool that winds up a string. The string is attached to the underside of the metal feeding dish under the cover, kept in place by a cut-out in the metal base. The pan of food slides into view and — voilá! — dinner is served. Like the V.I.P. Pet Brush, the subject of my very first blog post, the Kum-Pet Dog and Cat Feeder is a gadget from the “Populuxe” era, when peace and increasing prosperity led Americans to some giddy purchasing decisions. In the decades after World War II, people with extra money to spend began to direct some of this cash toward all sorts of powered kitchen gizmos including ice crushers and blenders, electric carving knives, meat grinders and mixers. Some gadgets were supposed to help housewives save money by taking on tasks as home, while others were intended to make routine tasks easier. Others, such as automatic pet feeders, responded to consumer interest in convenience, suggesting that even the most ordinary tasks could be enhanced by novel applications of simple technologies. As part of the family, pets became proxy consumers in postwar America. The expanding array of products intended to nourish, heal, house, entertain and ornament them suggests how ordinary people understood and accommodated the needs of their charges. In this case, automatic feeders were promoted as improving the lives of both pets and their people. Timed feeders allowed the designated caregiver to be away from home when it was dinnertime for Trixie or Pal, who could still expect grub to arrive at the usual time. The Kum-Pet feeder received its patent as a “Feeding Device for Animals” on 25 February 1947. This seems to be the only patent issued to Jerome Frankel, who I have been unable to track so far. Several men with this name lived in and around New York City at the time the Kum-Pet Feeder was offered for sale. The patent’s text suggests that the invention responded to problems with some existing feeders:”One of the objects of the invention is to provide an automatic feeder of simple construction having few parts which can be cheaply produced and assembled….of neat and attractive appearance, and which will be fool-proof and positive in operation…sanitary and easily cleaned.” The food pan in the Kum-Pet is an 8-inch metal baking pan, and the alarm clock is a Gilbert. The William L. Gilbert Clock Corporation had been in business since 1828 and was known for its alarm clocks at the time the feeder was made by Lorraine Metal Specialties Company of Brooklyn, new York. Farmers had been interested in automatic feeders for livestock for several decades when the Kum-Pet was patented. 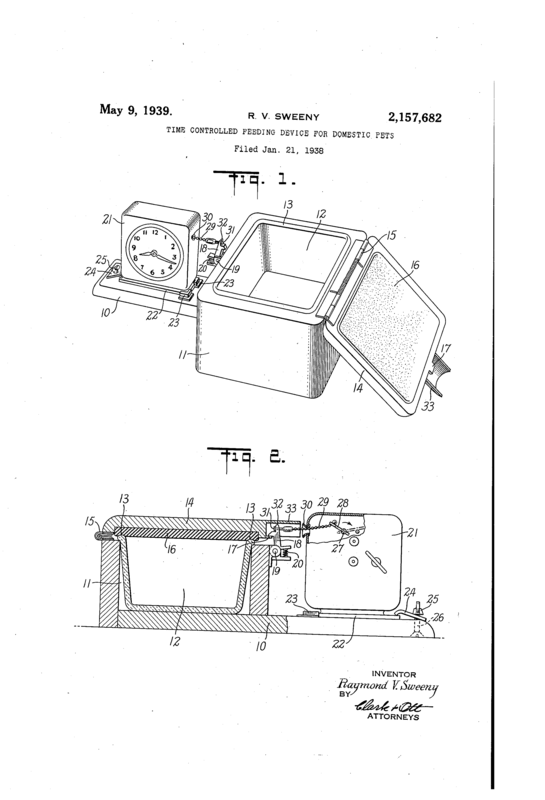 However, the first patented feeder that I have been able to find relating specifically for pets is a “Time Controlled Feeding Device for Domestic Pets (US 2157682), patented by Raymond V. Sweeny in 1939. Notice that this one also makes use of an alarm clock! At least five applications for automatic pet feeders appeared between 1946 and 1966. The timing of automatic pet feeders is congruent with wide consumer acceptance of packaged pet food, another convenience for busy households. R. V. Sweeney, “Time Controlled Feeding Device for Domestic Pets,” U.S. Patent 2,157,682. Patented 1939. I came upon your site researching the history of automatic pet feeders. This entry has answered my question as to when the first ones were made for the public. Very enjoyable too. Thank you. I am the photo editor for an upcoming “History of Cats” book we are publishing. When searching for an automatic cat feeder, I was directed to your site – we would love to include this image in our book. Would you be willing to grant us permission to use this image? Please feel free to email me at your earliest convenience and let me know if I can answer any further questions about our project. Hi Catherine — Tell me more. I own the Kum-Pet feeder, so I can provide permission, but I would like to know more about what you are doing — and I would like to be able to direct your readers to my work. I am the author of Pets in America: A History, which has a lot on the history of cat ownership. The information is on the photo caption.